WELCOME TO OUR HAWAIIAN RETREAT! - RENOVATED in September 2015! Many upgrades including a completely new kitchen, new bathrooms, new tile flooring, new furniture and electronics. Right across the road to ULUA and MOKAPU beaches. 5 of the best beaches on Maui are in Wailea within 5 minutes driving. You will love our spacious and comfortable, air conditioned, two bedroom, two bath, 1180 sq foot Villa! Fully furnished, with its own private dining lanai with a view of the ocean and Haleakala. Our condo is immaculately clean and impeccably maintained. This is a top priority for us. Our vacation villa offers wide open space for four, yet intimately relaxing for two. It has new carpet, fresh paint and new furniture - inside and out. And new TVs and DVD players. The condo is decorated in a relaxed, comfortable Hawaiian style. We know that you will be impressed and pleased with our excellent-rated condo! Both bedrooms and the living room have individual AC units. The Master bedroom has a king bed with a new mattress with memory foam pillow top. The Guest bedroom has two double beds with new memory foam mattresses. Our condo has all the comforts of home: wireless Internet, TVs in all rooms, a fully equipped kitchen, and a FULL-SIZED high efficiency washer and dryer set off the lanai (to keep the heat outside). Please scroll to the bottom for more PHOTOS and visit our personal website for further information. We are on the Wailea Blue Golf Course, at the Grand Champions Villas, in the middle of one of three courses among the best on Maui. Only a short 5 minute drive around the golf course to beach parking. There are views of Molokini, the ocean, tennis courts, gardens, and tropical birds. Use either of the two crystal clear swimming pools with lots of loungers and umbrellas. Each pool has a relaxing spa and Gas BBQs. Family owned and managed: we travel to Maui many times each year to ensure that our condo is ready for your perfect Hawaiian experience! When we visited Wailea, we were mesmerized by the beauty all around. We knew that on our next trip we wanted to stay there. We began looking for condos in Wailea and decided to try the Grand Champions Villas. Once we stayed at the Grand Champions, we returned for 3 consecutive years. We kept coming back because of the beauty of the complex. The grounds are impeccably maintained with lush foliage and every colour of flower imaginable. The pools are beautiful and offer a relaxing pool for older children and adults, but there is also a family pool where children can enjoy themselves with other children in the complex. The amazing ocean views from the lanai make our stays perfect! It was a natural choice for us to purchase our condo here because of how much we love the complex and how it just feels like home. The view from this unit is fantastic! We love waking up to the songs of tropical birds. We enjoy a walk down to the coffee shop and then to continue walking down to the beach while it is still cool. One of our favourite restaurants is a short 5 minute walk from the condo. We often walk down to the shops for the best pineapple coconut ice cream on the island. It is wonderful to experience so much within walking distance. We love it here at the Grand Champions, in Wailea and on Maui . . . there is simply no other place like it. toilet, shower, The shower is spacious and has 2 heads. Both bathrooms have new vanities in African Mahogany with granite counters, under-mount sinks and Kohler fixtures. All the tile is new, both floor and shower tile. Master shower is built in and oversized with 2 high quality shower head fixtures. Second bath has a built in shower with high quality fixtures. Several of the best beaches on Maui are within walking distance: Wailea Beach, Ulua Beach, Mokapu Beach, Keawakapu Beach and Polo Beach. The ocean in 1/2 mile away. Enjoy the Waliea Beach Walk fronting some of the best hotels on Maui. View of Haleakala Mountain from lanai. Beautiful view of the ocean and other islands from the Lanai. Separate a/c units in each bedroom and the livingroom. Linens, towels and beach towels are provided for your convenience. Full sized and private for your use. Marked reserved stall right in front of the building under the shade of a beautiful monkeypod tree. Wireless Internet access will allow you the freedom to browse anywhere in the condo and on the lanai. The livingroom has a couch, loveseat and chair for conversation, TV viewing and enjoying the beautiful outdoor views. New SS ultra quite unit. New SS side-by-side with water and ice in the door. New SS full-sized slide in Range. Paper products, soaps and assorted condiments/spices are provided. All of the dishes and utensils to create home cooked or gourmet meals are provided. The dining area seats 4 in comfort. 46' Flatscreen TV with DVD player in Living Room, 32' Flatscreen TV with DVD player in Master bedroom and 32' Flatscreen TV with DVD player in second bedroom. Each has cable. Provided with each of the TVs. Assorted beach toys are available. The Wailea Tennis Club is right next door. Guests enjoy prefered rates. Tennis racquets are provided. The Wailea Blue course boarders the property. Guests enjoy prefered rates. 2 Beautiful pools in the complex. Night Entry Security, deals on golfing at the Wailea Blue course and tennis at the Wailea Tennis Club great restaurants like Mateo's, Manoli's, Monkeypod and Longhi's nearby. David is a very responsive excellent owner and the condo is the best that we have found in Wailea. We highly recommend this unit. Great stay in beautiful Wailea! Condo is in prime location and well stocked. We loved the beach chairs, umbrella, small cooler and boogie boards. This was really home away from home. Thank you David for a great stay. Mahalo for your wonderful review! David and I are so happy you enjoyed your vacation and our condo met your expectations! If you’re on the island again, we would love to have you stay at our condo! This condo was the most beautifully decorated condo we have stayed in. It was well stocked and organized and very clean. There was everything we needed and more. Lots of kitchen and bathroom supplies as well as beach toys, coolers, chairs etc. The condo is in a gorgeous area and close to restaurants, shopping and beaches. The rental experience was extremely easy and we had no issues with anything . The condo is very spacious and we like that it has double beds in the extra bedroom for the kids. The furniture is new and the entire condo is very tastefully decorated in Hawaiian decor. The bed in the main bedroom is also extremely comfortable. We would definitely stay here again and recommend it to friends and family. We can't wait to return soon!!! Mahalo for that wonderful review! Nothing makes us happier than to hear that our condo has met all your expectations! We have stayed in many units before we purchased our own so we know that cleanliness is so important. We have an amazing housekeeper that treats our unit as her own. We are very lucky to have Megan :). We try to have everything you need for a beach vacation so your only concern is to get out and enjoy the paradise that is Maui! We welcome you to stay with us next time you are on the island! Lovely, well-maintained home. Owner has stocked it with all the essentials plus the little extras that make visitors feel welcome. Unit location is very quiet and peaceful. Great place to relax after an active day. This unit exceeded expectations in every way. It is by far the best provisioned vrbo we have ever stayed in. We took in the sunsets from the comfort of the porch. 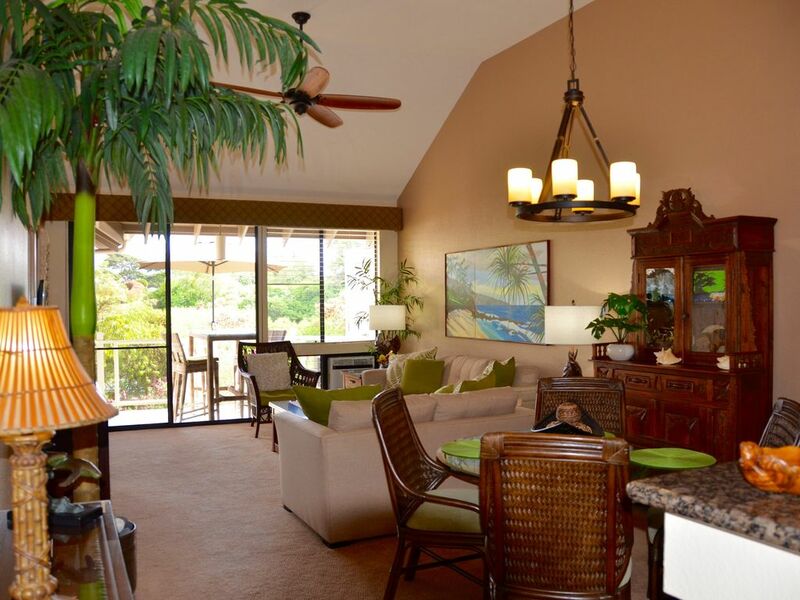 We love Wailea and this unit is within walking distance to most shops restaurants and beaches. David and Joanne were wonderful to work with. We will most certainly be back. Aloha and Mahalo for your kind words! We are so happy that our home met your expectations! We work hard to insure that all our guests have a wonderful place to stay so they can fully enjoy this special island :] We welcome you back anytime. Amazing guests, like you, make sharing our home away from home such a pleasure! And yes, sunsets from the lanai are incredible at this time of the year! Beautiful, updated, second floor rental w/sunlight throughout the day. Every detail was covered and provided: patio umbrella, fully equipped kitchen w/lots of extra spices & even coffee pods, beach towels, a closet full of excellent quality snorkel masks, boogie boards, beach chairs, etc. This rental faced the tennis courts, shielded by lush foliage; very quiet & private. Just what we were looking for. A wonderful rental:) Thank you David & Joanne! Mahalo for your kind words! We are so happy that our condo met all your needs and that you enjoyed your vacation! We do like to keep many spices, salt and pepper to make cooking easier. Every time we are there (3-4 times a year) we stock up on basic condiments and dressings and our guests contribute items too! Our housekeeper cleans the fridge of perishables, but will leave other items which can be shared. We also provide refillable coffee pods so our guests can try their favourite Kona coffees and it is much kinder to our planet! It is best to check before shopping to save a little money! We hope you consider us if you return to Maui! Maui, rated 'Best Island' in the world for the 9th consecutive time by Conde Naste, World Class Golf, Wailea Shopping Center, Restaurants (15 in less than one mile), Three mile walking boardwalk fronting world renowned hotels (Wailea Beaches ranked #4 world wide by Dr. Beach) and 5 mile-string of beautiful sandy beaches a short 1/4 mile walk from condo. This is our personal condo - we hope you enjoy it as much as we do. Specials for short notice availability. Rates are subject to change until the reservation is confirmed. Hawaii Tax ID Numbers GE-034-025-2672-01R and TA-034--25-2672-01R. Note - Tax rate reflects new TAT rate effective for stays after January 1, 2018. On-Island Representative named in rental agreement.